Hi, my name’s Ante Batarelo, I’m a licensed tour guide / operator & owner of Private Guides in Croatia. English is my native language as I grew up in Sydney, Australia and graduated English Language & Literature. I’ve been living in Split since 1991 and apart from teaching have been an active tour guide since 2000. Over the years I’ve shown Croatia’s sights to hundreds of people including many celebrities and internationally acclaimed people, i.e. former Israeli President Shimon Peres, CNN reporter Christiane Amanpour, US Senator Mark Begich & US travel guru Rick Steves. Some of the tour operators I work with are A&K, The Wayfarers, ROW Adventures and VIP clients for the Croatian Tourist Board. My itineraries range from walking tours of the 1700 year old Diocletian’s Palace in Split, sites like the UNESCO Island town of Trogir, Croatia’s acclaimed National Parks, ‘Off the beaten track’ destinations, ‘Island Hopping’, Croatia has over 1000 islands, must sees like Dubrovnik and exotic places like Mostar in neighboring Bosnia, Montenegro & other hidden gems. I’d love to show you the sites of this unique part of the world and tell you all about the history, culture, customs, trivialities and of course give you plenty of time to indulge in the local cuisine. Write to me and let me know whether you’re arriving on a port of call or would like a customized multiple day itinerary and I’ll get back to you within 24 hours. A memorable experience is guaranteed. The Dalmatian Coast is characteristic for it’s sparkling sea views and sleepy harbor villages, with their milk-white limestone buildings, making the perfect environment for the steady pace of life and relaxed cafe culture. It becomes apparent that Croatia is still the authentic and uncommercialized Mediterranean associated with a bygone era. “The Dalmatian Coast and it’s towns could possibly be the world’s haven for easy living, coffee shops, afternoon siestas and evening promenading”. “People here simply work to live, not live to work”. Split has a reputation as the town with the most beautiful women in Croatia and for it’s specifically very tall, lean, dark haired men. 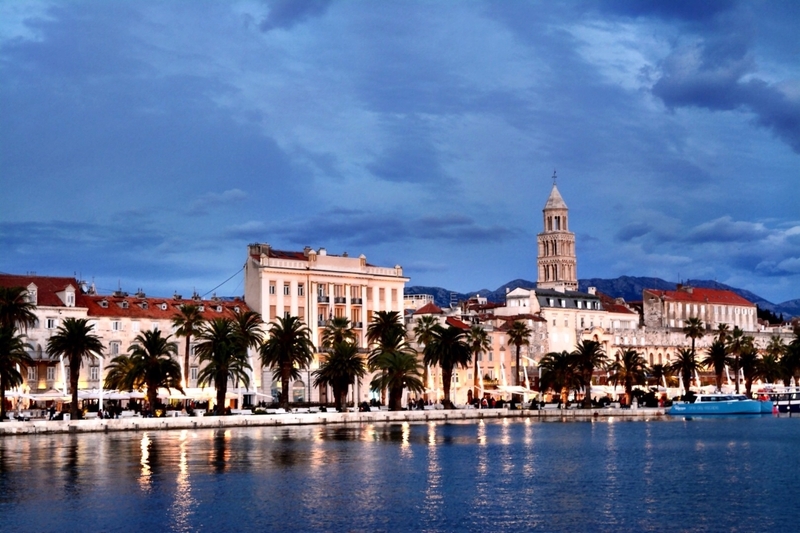 The mild climate, beaches, restaurants, taverns & cafe culture make Split the perfect destination to relax. Apartment Ideal is situated in the center of Split near Diocletian’s Palace, 50 meters from the main seaside promenade meaning easy access to all the local highlights. We were very glad that we contacted Ante and chose him as our tour guide in Split. He was personable, knowledgeable and catered our tour exactly to our requirements. I would say he’s one of the best tour guides we’ve had, and we’ve travelled a lot! I would recommend him highly to others. From previous cruises, we had grown tired of bus-load tours, with no changes possible and little time for questions. When we saw that we would have a day in Split, Crotia, we Googled “Croatian Tour Guides”, and booked a day with Ante Batarelo of “Private Guides in Croatia”, working on-line. It was just great! We had no problem meeting Ante at the port, and his car was spotless. More importantly, Ante’s English was perfect and his knowledge impressive. We really enjoyed being able to stay and ask questions at any spot (Diocletian’s Palace, in our case) rather than being herded to the next stop. We asked to eat lunch in a spot where he had eaten himself, and where we would not find any other tourists. We wound up at a little restaurant/taverna in the hills east of town, eating roast lamb. Excellant! Our only regret was that we could’nt spend longer. This past summer my wife and I had the opportunity to tour Split and Dubrovnik with Ante. The tours were outstanding and combined a great balance of easy to grasp history covering many centuries with insightful current day politics, economics and culture. While the tours were very informative they were also relaxing and informal. Ante and his other guides were very personable and knowledgeable. They were critical to our great experiences in two very special areas of Croatia. We highly recommend Ante. A sincere Thank You for the outstanding service you gave in helping me: to plan an itinerary for my family’s Coastal Croatian Adventure, to supply us with a fabulous driver for Dubrovnik and Split, and to personally deliver a first-class, in-depth tour of Diocletian’s Palace in Split. We loved the tour, but we will especially remember how you went above and beyond the call of duty with all things related to our stay: multi-city transports, tours, tickets and too many other details to mention. With your local advice and connections, we felt completely prepared and protected. In arranging a critical, last-minute transfer, you are to credit with ensuring we had a very successful family vacation in Croatia. (The driver left Split at 4AM to pick us up in Dubrovnik in time to meet a ferry back in Split. And this with only a few hours notice!) What a driver he was! Outstanding guy. We really appreciated all that he did to accommodate our scheduling, the storing of our bags, the return of lost glasses not to mention his passionate telling on all things Croatian. Because of your respective generosity, we have such great memories and can’t wait to return to Croatia-seeking out your assistance, Ante, and referring others to your excellent care. We were on holiday in the Split area in the Summer of 2010 and as a family group of 10 people from the UK – aged between 8 and 78 years – we decided to look for a good, English-speaking, private guide for Split, especially Diocletian’s Palace. We found Ante via his website and he turned out to be exactly what we wanted: punctual, well-informed, considerate, 100% fluent in English and amusing too. It cost us a little more than joining one of the standard tours but we all thought it was money well-spent, partly because a private tour is so much more flexible and relaxed, but partly also because we all liked Ante very much and enjoyed spending the morning with him. The Palace and city are worth seeing and very interesting, and you won’t regret hiring Ante as your guide. Highly recommended. What a joy it was being in Split with you Ante. You were a delight – so informative, welcoming and accommodating. Experiencing the beauty, daily life and history of Croatia through your eyes made our excursion a very rich experience. Your professionalism, talents as a guide, love of your country and warmth as a human being made our visit to Split one we will remember and treasure always. Thanks. A group of us went on a cruise in September and Split, Croatia was one of the port we visited. While doing research for a private tour, I came across Ante’s website and was immediately impressed by his credentials. When we started communicating through emails, his helpfulness and patience was much appreciated. The day we finally met Ante, we found out that he was courteous, knowledgeable, and could deliver information that gripped our full attention. On top of all that, he managed to organize our private tour efficiently so that we could see a lot of the country but in a very relaxed manner. Thank you, Ante, for such a wonderful experience. Your tour will always be an unforgettable highlight of our trip. It was indeed a pleasure meeting you and seeing the wonderful country of Croatia. We were most impressed with what we saw and truly enjoyed your dialogue explaining everything so well. All 6 of us agreed that it was the highlight tour of our cruise. There was no way that we could have seen both the city and countryside in one day, but you were able to do it so very well. Good luck in all your endeavors. We highly recommend your service. We stopped in Split as part of our cruise on June 6, 2010. Ante met us promptly at the ship and drove us first to Trogir, where we had a wonderful time touring the old city, and having coffee at a sidewalk cafe. We then drove back to Split and toured Diocletian’s Palace. It was a fun day tour, and Ante did a great job. We highly recommend this private tour! Having travelled extensively around Europe and having used private tour guides before, I was excited and somewhat nervous to book my trip to Croatia. I realized that I would be spending over a week in Croatia and that having the right private tour guide would have a big impact on how enjoyable my vacation was. Booking my trip with Ante Batarelo turned out to be the best decision I could have made. Ante has so many attributes I look for in a private guide. Most importantly, he is really easy to get along with. Ante has incredible knowledge of the history of the area and knows the type of things and places to go that only locals of Croatia would know and it was these type of things that made for an extraordinary vacation. Despite my wife and I having done a tremendous amount of research about what we wanted to do in Croatia, it became apparent to me soon after meeting Ante that following his suggestions would allow for an amazing trip. He recommended restaurants and experiences that I never would have come up with on my own. Originally from New York and being a high paced person, Ante was actually able to get me to relax and enjoy the vacation in the laid back style Croatians do. Without hesitation, I highly recommend Ante Batarelo as your private tour guide in Croatia.